A “food coma” is the common term used to describe the sensation of feeling sleepy or tired after eating. The term usually comes up in association with a large meal or one of the various food coma memes floating about the Internet. A food coma is characterized by fatigue and sleepiness. This differentiates it from a real coma which is when someone is unconscious and non-responsive to the sleep cycle or attempts at stimulation. Whether you are merely curious about the food coma phenomenon or are looking for a food coma cure to employ at the next Thanksgiving meal, you will find answers below. Does the Food Coma Exist? Yes, but not literally. A food coma doesn’t technically exist in the sense that you cannot normally experience a food-induced coma. The term refers to a real phenomenon, however. The medical name for feeling tired after eating is “postprandial somnolence,” but food coma is both easier to pronounce and more intuitive to understand. Although it’s possible that there is a psychological effect at play in feeling a food coma, there are very real physical explanations behind how one happens and why. What Causes a Food Coma? Understanding what brings about a food coma requires a little explanation about what happens to your body in general when you eat. Your organs and other internal functions are controlled by the autonomic nervous system which in turn is divided into the sympathetic and parasympathetic nervous systems. This is the basic phenomenon behind a food coma, but it’s not the only cause. The strength of a food coma is connected to how much you eat and the way it influences other biological behaviors that occur during digestion. Your blood sugar levels inevitably spike following a meal. As a way of controlling and breaking down the sugars, your pancreas releases insulin. One of the effects of insulin suppressing blood sugar is that you feel more tired and less energetic. Since larger increases in blood sugar warrant more insulin activity, large meals create a more pronounced sleepiness effect. Digestion is an energy-intensive process and “heavy” foods take more energy to digest than others. This ties into the behaviors of the sympathetic and parasympathetic nervous systems discussed above, but the basic idea is that your body aids digestion by diverting energy from less-essential functions such as muscle exertion. Incidentally, this is why you shouldn’t go swimming or otherwise physically stress yourself shortly after eating a large meal. Your body does not respond well when faced with conflicting priorities, as anyone who’s gotten a stomach cramp can attest. Food comas are most common after large meals—and large meals, especially at celebrations or holidays, are also a time when people are more prone to drink alcohol. Since alcohol is a depressant, imbibing can make you feel more tired after a meal and magnifies any food coma effects. A large sit-down meal is often the end point for an evening of work, a time to take a break, or the capstone of a holiday celebration or gathering. This deceleration contributes to a psychological effect that makes you feel more listless or and tired. Although most often blamed for the Thanksgiving food coma, turkey itself does not necessarily cause a food coma. Although turkey meat contains the serotonin-influencing tryptophan, so do numerous other foods such as chicken, fish, eggs, and various dairy products. The amount of tryptophan in turkey is not enough on its own to make someone sleepy without additional carbohydrates being introduced to carry it into the brain. Even then, the level of tryptophan may not necessarily be enough to make you sleepier than the normal food coma effect. Since digestion has its inevitable byproducts, large-scale digestion like that seen in a food coma can potentially make you gassy or otherwise feel bloated. As mentioned above, attempting to incorporate physical activity to your post-meal schedule runs the risk of adding stomach cramps to the list of symptoms. Do You Have a Food Coma Right Now? Did you recently have a large meal, possibly one with a lot of carbohydrates and/or meat? Are you too tired to read this article? Is it Thanksgiving, Christmas, your birthday, or any other day of celebration and gathering? Have you recently eaten turkey, chicken, roast beef, or steak, possibly with potatoes, stuffing, or other forms of carbohydrates? Have you recently enjoyed a slice of delicious cake or other desserts? If you answered “yes” to any of the above, you may be having a food coma. 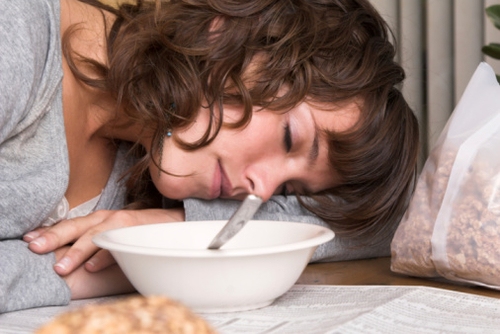 Can You Reduce a Food Coma? The only way to reduce a food coma is to let it run its course, so wait or take a nap*. A food coma is the natural result of your body trying to digest a large volume of nutrients and is perfectly normal. Even if there was a method of ending a food coma early, it would by necessity involve messing around with your nervous system and would likely cause far more harm than just waiting for the symptoms to go away. This can help shift control away from the parasympathetic nervous system. Although it may feel onerous to try any form of exercise while experiencing a food coma, exertion is one of the few ways that can consistently speed up recovery. If you feel cramping, though, stop and rest immediately. If you rest, do so by lying down on your left side to minimize pressure on the stomach. Although the idea of eating more may not be immediately appealing, try a glass of buttermilk to help boost digestion. Eating enough to induce a food coma usually means you’ve gained a pound or two as a result. Over the following days, emphasize fruits, vegetables, and lean protein in your diet to help slim back down. Some people like to skip meals earlier in the day with the intent of “saving room” for the large dinner at special events. This will end up increasing your risk of overeating since you will be extra hungry by the time the big meal comes around. Instead, make sure to eat normally throughout the day and consider having a small snack before going to a party to help even out your appetite. Although any overeating can cause a food coma, carbohydrates in particular are able to contribute to the effect more than other foods. Things like potatoes, rice dishes, pasta, and breads should be kept to a minimum as a preventative measure. This doesn’t mean you can’t enjoy such things during the holidays, but maybe only have one scoop of mashed potatoes instead of two. Dessert is delicious and fear of a food coma should not prevent you from enjoying it. However, this doesn’t mean you can’t be smart when doing so. Pick your favorite treat and eat it slowly. This both makes the flavor last longer and eases up the pace at which your body has to deal with the food. In addition to being a contributor to food comas, alcohol can also loosen inhibitions and make you more prone to overeating. A food coma, in and of itself, does not have side effects unless you fall asleep while driving or in a compromising position around friends with video cameras, markers, and some free time. However, the key thing to remember is that food comas are not supposed to be normal occurrences in a healthy diet. If you find yourself becoming bloated, sleepy, and otherwise drained after meals, it could be a sign that you are overeating regularly. Alternatively, it could mean you have an underlying disorder. For instance, diabetics are more prone to food coma-like symptoms due to hypoglycemia. So unless you have diabetes, a food coma or feeling sleepy after eating isn’t anything to worry about. Enjoy! “The Science behind the “Food Coma.” Dove Med web site, last updated January 27, 2016; http://www.dovemed.com/healthy-living/wellness-center/science-behind-food-coma/, last accessed April 5, 2016. Levan, J., “What Is a Food Coma (and Does it Exist)?” Food Republic web site, July 12, 2011; http://www.foodrepublic.com/2011/07/12/what-is-a-food-coma-and-does-it-exist/, last accessed April 5, 2016. Kraft, S., “So You Think You Can’t… Avoid a Food Coma?” Healthy Women web site, November 25, 2014; http://www.healthywomen.org/content/blog-entry/so-you-think-you-cant-avoid-food-coma, last accessed April 5, 2016.